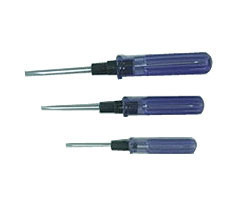 We are a leading name in the field of offering our quality conscious customers Diamond two Way Screwdrivers. These are precision finished and high quality screwdrivers that are designed to perfectly fit with the edge exactly as per the given grooves in the respective screws. The model options these are made available in include D-6038	in tip sizes of + 2x-6.0, D-6100 in tip sizes of + 2x-6.0, D-6150 in tip sizes of + 2x-6.0 and D-6200 in tip sizes of + 2x-6.0. Precise and high quality screwdriver fitting the edge exactly in respective screws.